Who doesn't love rich, chocolatey, ooey-gooey s'mores? The graham cracker crunch, the sweet melted chocolate, and the best part...the marshmallow! Now, have you ever had a s'mores-themed muffin? If not, you have to try these! 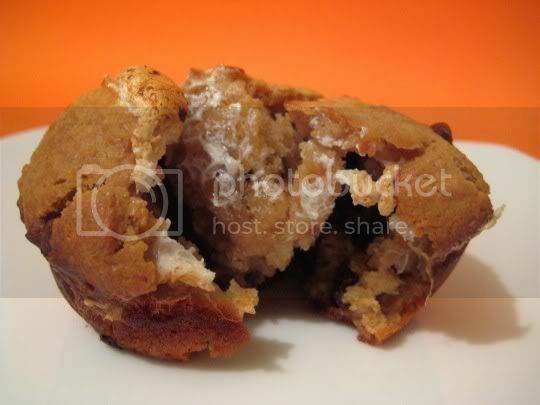 The graham cracker (crumbs are used) is actually in the dry part of the batter, so it's all throughout the muffin...along with a hint of cinnamon that adds a nice extra spice. Milk chocolate chips are folded in, and fresh from the oven, they're melted and smooth. A dollop of marshmallow creme (although I suppose you could use jumbo marshmallows) goes in the center of the batter before baking, and it spreads out to the tops, the sides, the bottoms, everywhere in the muffin. The top gets crispy and slightly burnt, just like real campfire s'mores! The best thing to go with these is, you guessed it, a nice cold glass of milk. Make again? Yes, this is a fun dessert that people of all ages will enjoy. A nice twist on the real thing!